December 6, 2016‑–Based on KIMTEK Corporation’s recent sales figures, schools and universities nationwide are selecting the company’s MEDLITE® Transport skid units for on-field medical transport at a growing rate. Providing athletic departments and school boards with an affordable, professional patient transport solution at football, soccer, and track and field events, KIMTEK’s MEDLITE transport system features a modular UTV side-by-side medical unit effective for first response at sports fields in elementary schools, high schools, and university stadium of all sizes. 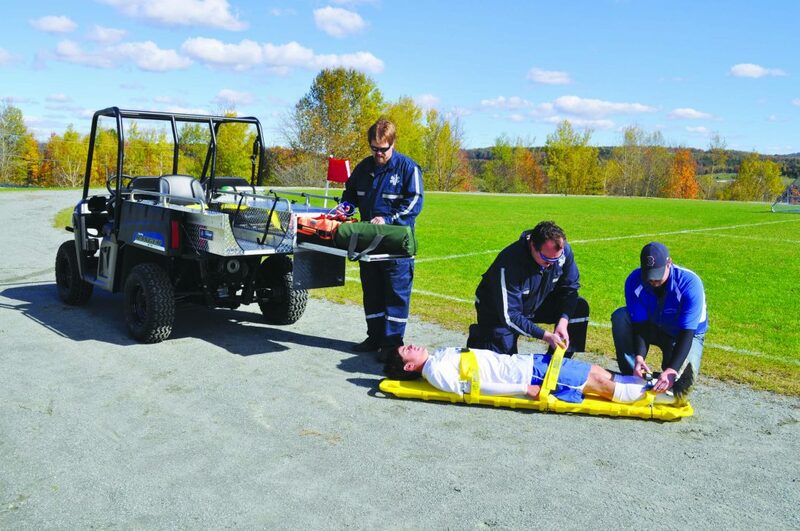 EMTs and athletic directors prefer the smaller, lighter UTV side-by-side unit for its ability to reach an injured player on the field with proper equipment and its capacity to quickly, efficiently transport a patient off the field to a waiting ambulance. Unlike a large ambulance, the compact MEDLITE system reaches a patient without harming natural grass or artificial turf, permitting sports play to resume and protecting school property. KIMTEK Corporation is the largest producer and marketer of ATV/UTV-specific skid units for public safety agencies in the U.S. Made in America, KIMTEK’s FIRELITE® fire and rescue skid units and MEDLITE medical skid units are now in service in all fifty states, all branches of the military including in Afghanistan with the U.S. Army, the National Park Service, numerous NASCAR tracks, sporting complexes, schools, universities, seven Canadian provinces and one territory, and in several other countries worldwide. Founded in 1984 as a research and development company dedicated to advances in life safety technology in the fire sciences, KIMTEK Corporation manufactures and markets a full line of FIRELITE and MEDLITE Transport skid units for emergency service UTVs and pick-up trucks. For more information, please contact KIMTEK at 888-546-8358 or visit the company’s website at www.kimtekresearch.com.